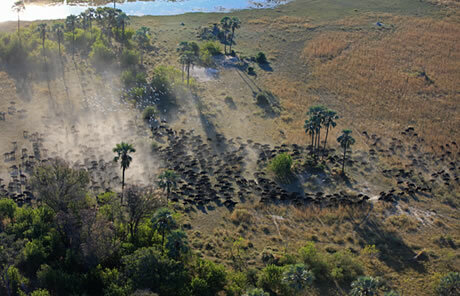 The Okavango Delta remains as one of the most beautiful and unspoilt wilderness areas left in the world. 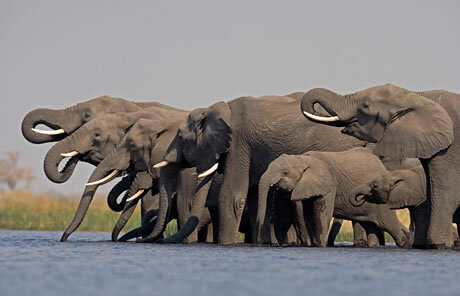 It is an extraordinary place that is transformed every year as the rains in Angola Highlands slowly fill the dry river beds and flood the arid grasslands, turning the delta into a criss-cross of glittering waterways. The landscape becomes a myriad of canals and lily covered lagoons and, with the life giving water, comes an amazing abundance of wildlife. Hippos snort and grunt as herds of elephant gracefully wade through the swathes of water lettuce, snow white egrets fluttering amongst them. Silver fish dart from under their enormous feet and the ever watchful kingfishers dart in a flash of electric blue to take advantage of an easy meal. Red lechwe and water buck nervously graze by the water’s edge before exploding in a spray of droplets, spooked by an old bull buffalo who has come down to drink, whilst he in turn is being carefully watched by the eyes of the local lion pride. 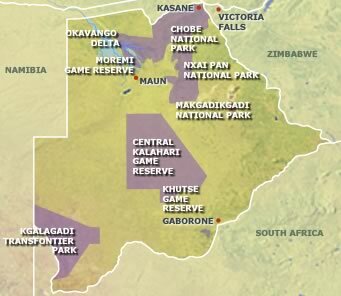 Northern Botswana is one huge wilderness area consisting of the Okavango Delta, Linyanti Wetlands, Moremi Wildlife Reserve and Chobe National Park. This magical place can only be reached by air and small aircraft take you into the delta from Maun or Kasane. The camps are located on small remote palm islands, offering guests an intimate safari experience with views of the floodplains from every deck and frequent visits from the local inhabitants. During the day you drift quietly through this paradise in small dug-out canoes called mokoros and at night, whilst recounting your sighting of the rare White-backed Night Heron, you listen to the music of the night, the distant rumbling of elephants, a yipping jackal family and the eerie moan of the lion as they wake and begin their own private game hunt. Guest numbers are strictly controlled in an effort to protect the unique ecosystems that thrive here and to maintain the tranquillity and peace of the area. Our team at Holmes Travel will be able to advise you on the best camps to visit and how to put together your perfect itinerary. 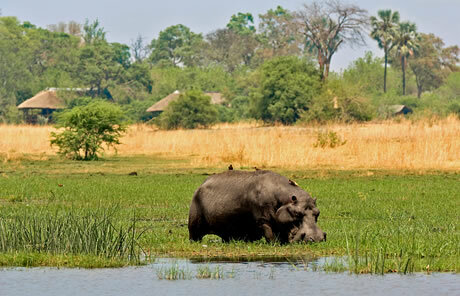 An 11 day trip which allows time to explore the beautiful Okavango Delta and also visit the magnificent Victoria Falls. Day 1: Overnight flight from UK to Johannesburg. Day 2-3: Arrive Johannesburg and fly from there to Maun in Botswana. 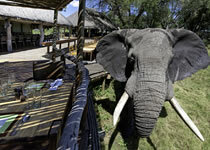 Arrive Maun around lunchtime and then small plane flight to Nxai Pan National Park. 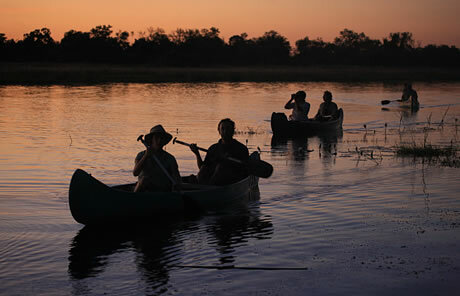 Day 4-5: Fly to Kwara Camp in the Okavango Delta and stay 2 nights. Day 6-7: Fly to Lebala in the Linyanti region and stay 2 nights. Day 8-9: Fly to Livingstone, on the Zambian side of Vic Falls. Transfer to Stanley’s and stay 2 nights. 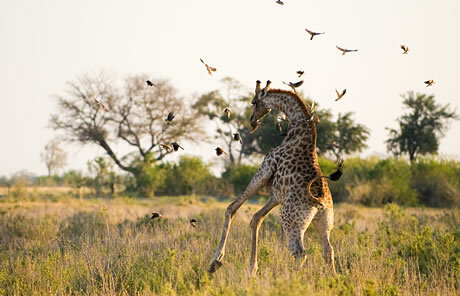 Day 10: Fly from Livingstone to Johannesburg to transfer to your International flight back to the UK. Day 11: Arrive back into the UK. 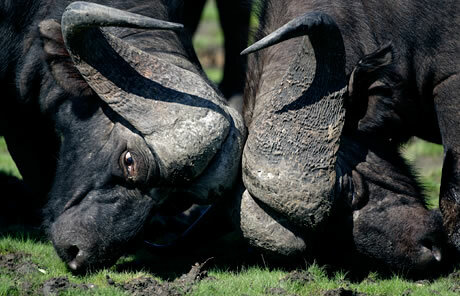 Prices are from £3615 per person including international flights, internals flights, transfers, game park fees and meals.